Kien's language and communication skills are improving day by day. He is mimicking the sounds we make, and it is fascinating how quickly children develop their communication and speech. Kien uses the signs he has learnt to communicate with us. He will rarely sign when we ask him to show us - he isn't a performing seal after all. So I'm lucky to even have any videos of him signing anything. Words he can sign are: milk, water, cracker, raisin, shoes, hat, bath, sleep, again, light, eat, more, all finished. There are a few words he can say but didn't bother to sign, such as apple, banana (he says "nana" and when we say it properly back to him a few times he migrates to "nanana"). My favourite so far in his attempt to speak is the word tunnel - Kien says "nunnel" - he loves his nunnel and wants to play with it all the time. As his speech develops and he realises we understand him when he speaks the word only he will drop the signing. I just hope I can catch a few more on video before he doesn't sign anymore. He can sound out to 3 songs: Baa Baa Black Sheep, Row Row Row your Boat, and ABC. Here is Kien's rendition of ABC. I just love that laugh so much! Did you know I was teaching Kien Tai Chi? Kien has just started noticing that his hands can get dirty. It never used to register or bother him. But now when he falls over or puts his hands into something that sticks to them - like mud, gravel, bark or dirt, he examines his hands, then come over to show me, then shakes them and "complains" to me via a string of annoyed sounding jibber-jabber. He doesn't actually need me to wipe his hands off thoroughly - just enough to show him my acknowledgement of his hands' dirtiness. Kien looking at what's stuck on his hands after toppling into the wet mulch. Cornwall park is so beautiful any time of the year, and on Saturday morning was no exception. We were lucky to have a break from the dreary rain that graced us during the week. I am often surprised when I observe Kien walking so confidently, because it wasn't so long ago that he developed this ability (actually only 3 months ago when he started walking unaided). Now he runs, walks backwards as well as on tip-toes, up small stairs, and (in the last week or so) down stairs. The guttering was more to his liking than the path. We had a brief picnic of honey sandwiches - Kien however only wanted to feed and chase the pigeons rather than actually eat his. Sunday turned out even more radiant weather, so it was inevitable that we would end up at a playground or beach - hey, how about both? Kohimarama was where it was all happening and most of Auckland parents were thinking along the same lines and were out enjoying the sunshine too. Jef and I made shadows on the padded ground. I think the council did/does an excellent job with re-sanding and maintaining the beaches along the waterfront. If Kien could talk he would say so too. I love Rangitoto and the yachts in the background. 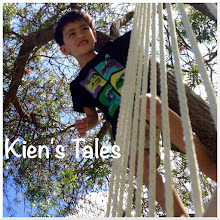 Kien is such a great climber, and is fearless [it seems]. He will always make an attempt at climbing whatever objects he fancies. I enjoy watching Kien fixate on the seagulls as they swooped and frolicked, scavenging whatever is available. We came home and did some carpark art. I'm liking the sidewalk chalk - it just adds such vibrancy to our parking space. I hope the neighbours feel the same way, because the canvas is slowly expanding beyond the borders. Playgroup is awesome! It's our third week in a row for attendance, and the majority of my coffee group pals also meet up there. Despite the craziness of having so many kids and parent(s) there it is actually quite relaxing. The place really is an oasis of joy. There is just so much for the children to do - and all kids love the sandpit, as evidenced by it's popularity here. Kien was patient; he ventured around the grounds for a while. And when he returned the sandpit was empty, and he was able to play to his heart's content. Then there's the tunnel slide - oh boy does Kien love tunnel slides! He went up, and down, and up, and down etc etc. ...with his 2 new found best buddies - they are 3 years old. After fighting it out with them for his spot on the padded thing they all eventually started playing very nicely together. Lots of joviality indeed! We visited my aunt in the afternoon. He was such a character at her place; playing hide-and-seek running around the rooms and us saying "where are you? ", and when he sees us he runs away laughing. He saw there were wooden ducks inside the barrel, and pointed them out to us. And after he walked the fluffy stuffed dog around by it's ear he climbed on top and bounced on it's back. My aunt had cooked some yummy meatballs with water chessnuts and fresh tomatoes, and she fed that to him with some baguette and rice noodles. He ate quite a bit at her place, and then when we got home he wanted more dinner, so he had a second helping! He had a good eating day today too, which always pleases me immensely. Back to work tomorrow, OY. Here's hoping Kien sleeps through tonight (yeah, right - like that's ever going to happen!). Typical Auckland weather last Tuesday; oscillated between heavy showers and sunshine, greyness and blue skies with fluffy billowing clouds. Perhaps I was anticipating his eagerness and delight with seeing and petting farm animals at Ponsonby playgroup on Tuesday morning, and in doing so I was inadvertently placing an expectation on Kien to behave in a certain way. The playgroup organisers had shipped in goats, sheep, chickens, ducks, ponies, rabbits – and a rat. For some reason my loathe for rodents did not extend out to this particular rat that day, and if Kien was game to pat the creature I would have surely done the same. But he didn’t; in fact he hardly left my arms/hip that morning. Whilst being held by me and with a bit of coaxing he did pat a goat. He warmed up slightly toward the end. He asked for his milk, I gave it to him, and then he was willing to venture a little closer to the Shetland ponies. He didn’t want a ride though. We had a met up with the family in Herne Bay planned for afternoon tea. As I pushed Kien along in the stroller on the way there he was happily pointing at things he noticed (like dogs, cats, birds, planes, leaves, sticks) and chatting merrily, with the frequent inquisitive upward tone change in his voice and a glance back at me so I can acknowledge what he is saying (or pointing at). An “oh yes, good boy” or a replication of what he just said is a sufficiently appropriate response for him in these situations. We sat outside Dida’s and enjoyed the warmth radiating from the heaters. I’m glad I had finished my latte before Thomas knocked the glass off the saucer and it smashed onto the pavement. An expression of fascination as Thomas watched the cars zooming by. Kien had a minor fall from his chair, but he recovered quickly with a hug from Rod. The crying must have been contagious because Thomas starting doing his pouting thing. Both boys were fine in less than 2 minutes. It was a day of vacillation; coldness and warmth, rain and fine, hesitancy and hardiness, glum and cheerfulness. Hey, it’s the contrast that makes me appreciate the good times that much more! Hey everyone, look this way! Last winter Kien was such a tiny wee thing and therefore staying indoors (in the apartment) wasn't such a big deal. He would scoot around on the floor and roll around while bopping the dangly things we hung on the tripod for him. This year however is different. Since he started climbing, running around everywhere and exploring his environment staying inside the apartment means that lots of things will be banged on the floor and the place is a trail of destruction. I've been thinking a lot about indoor playgrounds for the winter time, and I cannot bare the thought of McDonald's playgrounds or those awful Lollipop places that are soulless (in my humble opinion). Over the weekend one of our neighbours downstairs had a birthday party and tied balloons around the place. She hasn't taken them down yet. We played in the stairwell for a while; Kien loves balloons! He presses his face against the balloon and makes sounds - he is just like his Dad. Now that the sun graces the other side of the world for a longer stretch we haven't been able to enjoy the park facilities down the road after dinner. Good thing Kien loves bath time - you only have to mention the words "bath time" and and he's saying and signing it, and is happy for you to take off his clothes so he can scamper into the bathroom and clamber into the bath. Unless he is in some sort of discomfort (in which case he is irritable regardless) bath time is a long and drawn out affair, complete with assembling and disassembling megablocks numerous times, squeezing and throwing bath toys, transferring water from different objects, drinking bath water, splashing and laughing at Mama when she gets wet, and lying in the bath to blow bubbles. Yes, that's him blowing bubbles while lying in amongst all his bath toys. We spend about 30-40 minutes in there every night, sometimes longer. He also points at the shampoo bottle and yabbers to me, and I'll wash his hair and rub the suds all over him. He also points at the tube of Pinetarsel soap substitute, and giggles when I rub the green gel all over his body. Bath times are lots of fun, and I am glad. What else is fun as we discovered on Sunday afternoon was the Auckland Museum. Who needs a playground when there is a whole space on the first floor dedicated for kids. It's a tactile area, and we had a blast. He enjoyed running back and forth on the giant jigsaw puzzles. I love how Jef enjoys teaching and showing Kien how to do things, and Kien does pay attention. I've come to realise that a playground is what you make it - anywhere is fun if Kien is having fun! I've had my second mother's day of my entire life...and so did Kien, as a matter of fact! He fills my heart to the point of overflowing every time he smiles, or says "Mummy", or "Mama", or "Mum" - he says these words often, and shares his smiles readily. He makes me happy, and now that he understands when I ask for kisses he does the whole lean-in-and-pucker thing (and slobbers me with an open mouth wet kiss) I can't help but love him even more (I never realised that is even possible!). I also never thought I would gush as much as I do over my kid! Hey, it's a biological thing. Coyle Park was the place to be on Sunday morning judging by the amount of people there. Kien of course knocked himself out (figuratively, not literally) with the amount of fun he had. We headed to Mum's for a lovely visit in the afternoon. We sipped tea and ate bakery delights whilst Kien played with his new pre-loved $8 Trademe tunnel - fabulous! And we sat and watched the guys plugging in the Apple TV; we then proceeded to spend the next 30-60 minutes loading apps and activating home sharing and entering in passwords a gazillion times. Mother's day is awesome - I can finally attest to that! On Saturday night we were very lucky to have Sandra babysit Kien while we gallivanted to a birthday party in Greenhithe. Jason made some dangerously delicious mojitos. I had some fun with the camera trying to practice my low lighting photography skills (or rather lack of). But I do like this one - paparazzi on the loose.